Sample Concentrator is mainly used in the concentration of samples in batches, such as drug screening, hormone analysis, liquid/gas phase, as well as mass spectrum analysis. 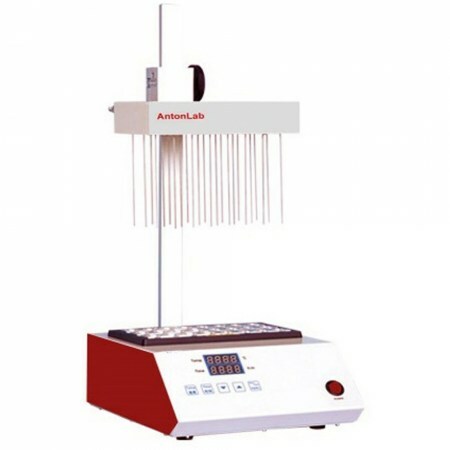 Blowing the nitrogen into the surface of the heated samples, so that the dissolvent in the samples can be evaporated and separated quickly, which comes up to the oxygen-free concentration and keeps the higher pureness of samples. The use of sample concentration instead of the commonly used rotary evaporimeter for concentration, can have simultaneous concentration of dozens of samples, which makes the sample preparation time greatly shortened, and has the advantages of time-saving, easy operation and fast. Automatic fault detection and alarming. Flow-meter pressure reducing valve is optional.